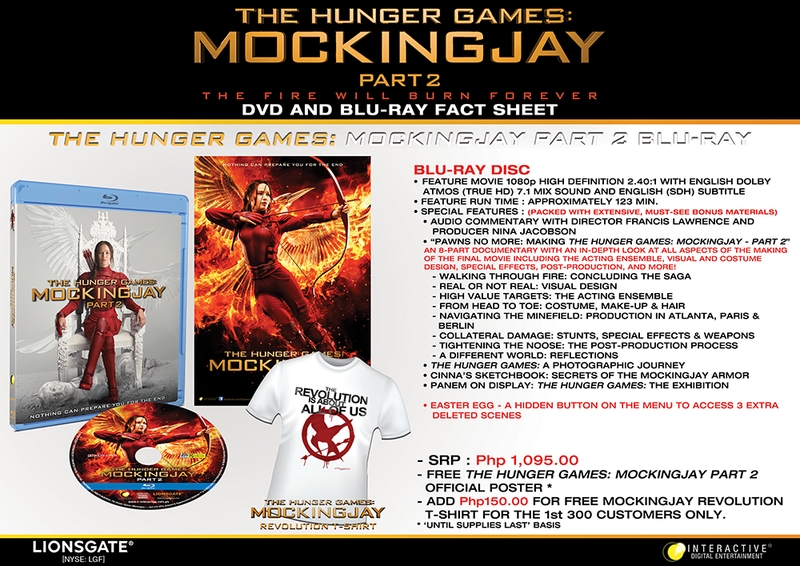 UPDATE: We have confirmed with the Phillipines home media distributor that the deleted scenes are indeed from Mockingjay Part 2 and not the previous films! Still no word from Lionsgate themselves on this. Since the special features for the Mockingjay - Part 2 home media release have been announced, we were concerned about the, for the first time since the first film, lack of deleted scenes from the final film. Director Francis Lawrence mentioned in interviews that while the film didn't have many actual deleted scenes compared to the other films, there are a couple of moments that didn't make the final cut, such as a video call between Katniss and Haymitch and an anticipated moment of Katniss killing a civilian woman in the Capitol that was seen during the Paris shoot. Also traditionally, starting from the first film, Lionsgate always put hidden extras, usually known as Easter Eggs, in the Blu-ray releases for the films. For the first film it was a hint at the reveal of the existence of District 13, for Catching Fire it was a faux-propo featuring the destruction of District 12's The Hob, for Mockingjay - Part 1, alongside the varying main menus featuring the full versions of Katniss' "You Burn With Us" propo and President Snow's rebel address, it was Katniss' failed "We End This Hunger For Justice" propo. 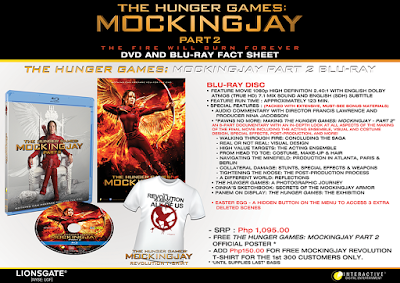 Which brings us to today's news - the Philippine distributor of the franchise on home media, C-Interactive Digital Entertainment, has revealed today with their announcement of the film's release in the Philippines (which includes a 2-disc DVD edition with the BTS documentary and the Target bonus features), that the Easter Egg on the Mockingjay - Part 2 Blu-ray (not DVD) releases worldwide features 3 deleted scenes! It is unknown at this time whether these deleted scenes are actually from the final film, but we are curently looking into confirming if they are. We won't be surprised if they indeed are, and it would definitely be a nice way for Lionsgate and the filmmakers to give back to the fans and include these deleted scenes, even if the scenes themselves were not 'complete' or not numerous enough to go on the main bonus features. Stay tuned as we keep our ear to the ground to find out more about this.